Checking out a canyon on the Jebel Sahro Circuit. After climbing Mount Toubkal, Morocco’s highest peak, I wanted to get off the beaten track a bit and do some self-supported trekking in Morocco. After much research, I found out about the Jebel Sahro Circuit trek. It had everything I wanted: navigational challenges, backcountry camping, and absolutely no crowds. If you don’t have time to read the whole post, skip to the bottom for the quick how-to summary. 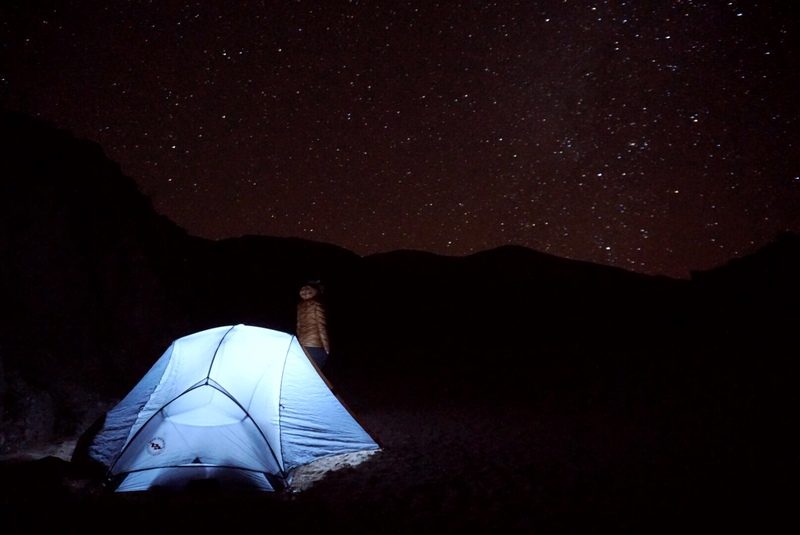 A night under the stars on the Jebel Sahro Circuit. From Marrakesh, we took a bus to Ouarzazate then another one to the smaller town of Boumalne Dades. In Boumalne Dades, we found a reasonably priced hotel we liked. We still didn’t have a map for the Jebel Sahro Circuit, and I noticed the exact map we needed was framed and hanging on the wall of the lobby. I asked the manager where he got it, and he made a phone call and had someone deliver a map for us. Furthermore, he agreed to hold our extra belongings for us while we were away on the hike. The place was called Hotel Bougafer, and I highly recommend it if you’re on a budget and looking for somewhere to base yourself while preparing for a trek. Have everything you need for your trek before you leave Marrakesh. We made the mistake of not buying a fuel canister before leaving the city, and spent the whole hike cold hydrating our food and building a fire to cook on. There’s a Decathlon in Marrakesh, which will have budget hiking supplies. There is a grocery store in Ouarzazate where we were able to get all the food we needed. They had a pretty good selection. We ended up buying cans of tuna and sardines, pasta and sauce, granola, cookies, chocolate, crackers, and cheese. However, if you want anything specific or are on dietary restrictions then do your food shopping in Marrakesh. There are no permits required for this region and guides are optional. One of the occasions there was a road to follow. According to my guidebook, Jebel Sahro translates to “the land of thirst”. It’s basically a hot and dry desert with few water sources or options for shade. It actually reminded me quite a bit of Southwest Utah. From Boumalne Dades, we took a shared taxi one town over to Kalaat M’Gouna, then another taxi a short distance to Ait Youl. Finally, we could begin walking. We made it all the way through the village of Ait Youl before being invited in for some tea by two brothers. They took us to the courtyard of their family home, and we were given several cups of mint tea, bread with jams, and nuts. We even got an invite to spend the night, but we wanted to actually start our hike. Finally, we began the walk over the hill and out of the village. There was a confusing series of dirt roads around, but I managed to find the dry streambed that the guidebook said to follow. I shot a bearing on my compass to be sure we stayed in the correct direction. The streambed wound through some mountains and finally up a hill where we could view our surroundings. I couldn’t spot anything that looked like the guidebook description, so I continued to follow my compass. After several more hours of walking, we finally spotted a village in the distance. We hiked down to it then followed a dirt road. However, our guidebook had been written over a decade ago and said to turn up a trail after the last house. New houses must have been built after the book was written because we missed the turn and had to backtrack. Once again on the right path, we hiked along and spotted a nomadic camp. The two camp dogs came out ferociously barking at us and clearly didn’t want to us to come any closer. It was almost time to set up camp anyway, so we veered off the trail into the riverbed and found a tent spot far away from the dogs. Only try this circuit without a guide if you have experience navigating with a map, compass, and GPS. Sometimes there is no trail and you have to shoot a bearing on your compass to find your way. The guidebook was written over a decade ago, therefore descriptions are not always up to date. I recommend getting a copy of Moroccan Atlas: the Trekking Guide. The descriptions are overall helpful, even if they are sometimes outdated. Perhaps the best feature, is that the book includes GPS coordinates for water sources, villages, and campsites. This was extremely helpful for navigating our way. Also pick up a map of the region. We were lucky that our hotel manager was able to get a copy for us, but perhaps it would be wise to plan better than us and get it ahead of time. Bring a compass as well, and know how to use it. The water source makes everything around it green. The following morning, finding water was a top priority since we didn’t have a water source at our campsite. We continued on up to a pass. Sometimes there would be a trail to follow and sometimes there wouldn’t be. We dropped down and passed through a black canyon before going up once more. Finally, we spotted green grass and a few trees, a sure sign of water. There was a group of men by the stream, cooking lunch and letting their mules have a break. After we filled up all our water bottles, they waved us over for some tea. Then they gave us plates of salad, bread, and cooked vegetables. We couldn’t believe our luck. I was confused about what they were doing out there exactly, until a large group of trekkers started showing up. Then it made sense to me that they must work for a trekking agency. We said thank you and continued on our way, passing about 30 college-aged kids as we hiked. I was happy we were moving the opposite direction of such a large group. As we walked on we finally reached the part of the hike where things become a circuit. The trail veered from South to East. The heat was unpleasant and I was getting sunburnt. It struck me how this would be such a tough place to live. The weather is not unlike Southwest Utah where I was living previously. But I get to hang out in the air conditioning when it’s hot. I have an escape from the conditions. The evening brought us to yet another streambed where we could pitch the tent. The ground everywhere else was rocky and uneven. The streams were the only places where we could find a comfortable spot. As the sun set, I watched a herder bringing his sheep in for the night. After another couple hours, the stars shined brightly with no light pollution nearby. Water is a top concern on this hike. While you can reasonable make it between water sources, they certainly aren’t everywhere. First of all, bring enough containers to hold 3-4 liters of water. You’ll need about that much between sources. Perhaps even more if you drink a lot of water or want to cook for almost every meal. The guidebook will tell you where the water sources are and even have GPS coordinates for them. Look for the green places in the otherwise brown environment. If you see grass, plants, or trees water will be close by. Usually it’s a stream and sometimes locals have made canals to direct the water to their plants. We set up the tent in the ruins of a Kasbah. The morning brought us through another village where we took a break under a shady tree. We followed the riverbed North. I was watching the ground because there were so many big rocks to step over. I was taking one big step up when all of a sudden there was a baby cobra in front of me. He was arched back and hissing at me. I nearly stepped on him. After that, I anxiously watched every step. After getting out of the river bed, we started uphill to a pass. I thought it would take us less time to get there, but it seemed to go on forever. I was getting worried about our progress because we were hoping to finish the hike the next day and still had a long way to go. After finally reaching the top of the pass, we hiked down through a slot canyon. The walls of the canyon stretched high above us and were red-hued. Upon exiting the canyon, we saw the ruins of a Kasbah beside several palm trees. The day was almost over, and we could see the rocky valley we had to continue up. It would be unlikely that we would find a good campsite further along. We decided to set up the tent in the Kasbah. Across the riverbed from us was a group of trekkers with canvas tents, a cooking crew, and mules. I had a tinge of jealously of their luxuries, but I also knew that the going rate for doing this hike with such a trekking agency was about $1000. We had spent about $80 total on our hike between groceries and the guidebook and maps. So, I wasn’t too jealous. Before long, three little boys came along trying to sell us homemade braided bracelets. I didn’t really want any, but the boys were cute and only asking 50 cents for the bracelets so I bought a few. Taking a break alongside the road. This is the desert after all, so it’s a fairly oppressive environment to survive in. Here are the things to be aware of and protect yourself from. The sun. There’s almost no protection from the sun during the day. Wear clothes that cover you up well, apply sunscreen, and wear a hat and sunglasses. Water. As I mentioned previously, water is precious in this region. Fill up all of your water bottles at every opportunity and don’t waste any. Snakes. This would not be a convenient place to get bit by a cobra. If you see a snake, back off. Don’t try to get close or take photos. Just leave it alone. Dogs. The dogs that guard the nomadic camps are not like the friendly street dogs elsewhere in Morocco. They were scary. Don’t run away from them. Just calmly walk away. Getting lost. As I’ve already said, make sure you’re competent at navigating in the backcountry before you go out on your own. If you’re having doubts, hire a guide. Hiring a guide is only expensive if you book online with an overpriced agency. Ask around once you’re in Morocco and you can get better deals. This was what we hoped would be our last day of trekking. We wanted to make it back to Boumalne Dades by nightfall, but we had a long way to go. We started the long walk up the valley to the pass. It took several hours of walking up a river bed, then climbing to the pass. Finally, we could begin the long walk down to the flatlands. Our original plan had been to walk to Boumalne Dades where we had left our extra luggage. However, once we were out of the mountains Kalaat M’Gouna was six miles closer. We began the journey along the dirt roads toward Kalaat M’Gouna. We walked by goats, sheep, and houses. Several shared taxis passed by us, but always going the opposite way as us. We finally reached a highway, but still had a long way to go to catch a bus or taxi. We walked through the outskirts of town. Children greeted us, and cars passed us by. A car stopped and the driver offered us a ride. We hopped in the back, and he took us to the shared taxi stop. I couldn’t believe how smoothly our plan was going. We were actually going to make it to Boumalne Dades. I would be able to shower, put on clean clothes, and perhaps have a delicious Moroccan dinner. One of our campsites in the riverbed. From Marrakesh, take a bus to Ouarzazate then another bus to either Boumalne Dades or Kalaat M’Gouna, depending on where you want to start hiking. Then towns are close, so it will be the same bus regardless. Store extra luggage at your hotel in either Boumalne Dades or Kalaat M’Gouna. Have all the gear you need for the trek before leaving Marrakesh. You won’t be able to find backpacking equipment elsewhere. You can buy food for the trek in Marrakesh or at the small supermarket in Ouarzazate. Have capacity to carry 3-4 liters of water. Water sources are scarce. If you’re going without a guide, know how to navigate the mountains. There are sometimes no trails to follow. Bring a copy of Moroccan Atlas: The Trekking Guide. And have a regional map and a compass. This is entirely a wilderness hike. There’s nowhere to stay or buy supplies (other than one village that is out of the way. I didn’t go there, so I can’t verify anything. ), so you must be fully prepared before setting out. Overall, the Jebel Sahro Circuit was a perfect way to escape the typical tourist trail in Morocco and do some self-sufficient trekking. Do you guys prefer remote, out of the way trails like the Jebel Sahro or more popular hikes like Mt. Toubkal?